The Red River Valley boom began in the 1880s. Heavy immigration, mostly of Scandinavians, Poles, Bohemians, and German-Russians, helped first populate the area. The migration demographics of the West were shaped by the Red River tributary that ran through the Minnesota and North Dakota valley and railroad lines to the newly formed area that we know as Fargo. With the migration of people came the expansion of religion and customs; many practices and backgrounds came to the communities that were taking permanent form. Quickly, the railroad crossed into the Fargo area and two small communities surfaced on the landscape west of the river. Each community soon acquired the local names of “Fargo in the Timber,” located on the banks of the river, and “Fargo on the Prairie,” which was nothing more then a tent city built upon the present-day Main Avenue locale. Ironically, it was the tent city where United States Army officers accompanied railroad surveyors and their families. Many historic calculations estimated that this tent city consisted of about 100 people who lived in approximately 50 tents total. Fargo’s early ethnic migration helped establish “Old World” or traditional religion. Those different practices and places of worship help with the understanding of how each brought together individual religious enclaves into a larger community of devoted settlers. As one might expect, the area was home to many Native Americans before the arrival of European immigrants and Euro-American migrants. The early exploration of the Red River Valley also brought in migration from Norway, Sweden, and France. Therefore, a great deal of heritage was concentrated within the confines of Fargo and many religions naturally began as migration of the ethnic groups continued to grow. Additionally, the new settlements also included many other sectors of ethnic diversity that many might not expect on the prairie, among them Russian Ukrainians, Asians, African Americans and Arabs. The working railroad greatly facilitated the new and diverse people who came through Fargo. The significance of so many immigrants brought diversity, but by the year 1885, many of the immigrants were Russian-German. Still, the census and other records of population growth proved that by 1915 over 79 percent of North Dakota’s overall population consisted of immigrants and their offspring. This composite of the churches that arose in the period of 1890 – 1900 helps to better understand how the different ethnicity brought a different flavor to the landscape of Fargo. This picture was taken of the churches in the time around 1890-1910. It indicates that during this time, the facades showed there were skilled craftsman in Fargo’s early settlement period. Each of the churches found seems to have a brick facade. 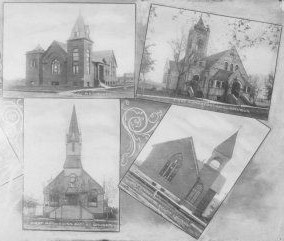 The churches appearing in on this photograph are Gethsemane Episcopal Church, First Congregational Church, First Norwegian Baptist Church, Robert Street German Evangelical Church, and the Broadway Methodist Episcopal Church, all of which represent the religious diversity in the new settlement called Fargo. The photographs of the churches also bring out many details that often not noticed when first viewing a vintage photograph, but after a little bit of time spent reading and fact finding, it is the unseen that speaks the loudest when you examine a picture and consider its historical context. Please click here to be linked to a slideshow featuring Fargo’s churches.